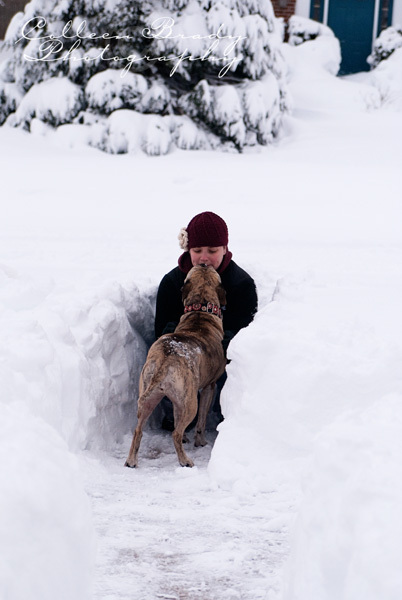 With all this snow we've gotten, it felt like the blog needed a little face lift to something a bit frostier. Once again, Zoe saves the day! WOOT! 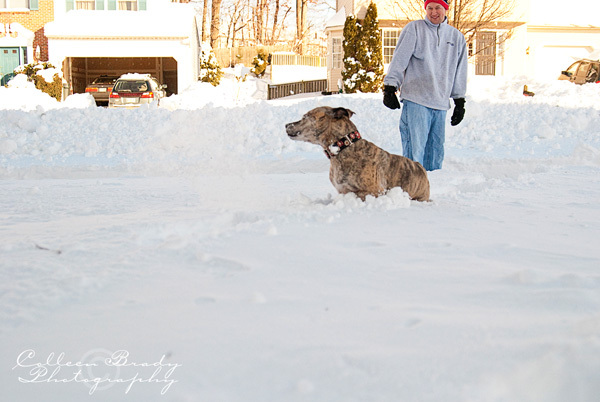 I'm getting some pictures edited from Snow-mageddon Part 2. We ended up snowed in for 2 days this week (wednesday and thursday) and got another 2 feet of snow. That's around 5 feet of snow in less than a week. ::blink:: I love snow and being snowed in, but that's just nuts! Lol! Of course it's made even worse because this state has no idea how to deal with that sort of volume of snow in such a short amount of time. There are a lot of streets in the city that will only be passable if the residents dig it out themselves (with some help from the sun). The plows just can't get through without risking a LOT of damage to vehicles, and it's not a risk that they are going to take (especially considering we're over budget on snow removal this season, and the economy in general just blows). 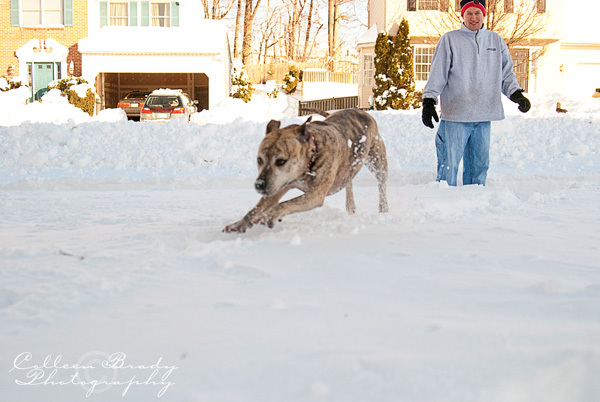 Tiger is still thoroughly enjoying herself and all the snow. 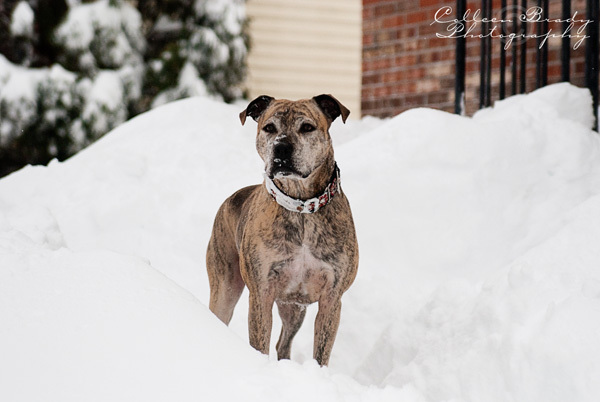 I can only guess that the snow makes everything smell differently, because she has sniffed every square inch of the yard at least 3 times since we got it all, lol. It's the same yard Tigah-now! We do have a few sets of small tracks in the as-yet-untouched backyard, which is pretty cool to look at from the windows. We think they're rabbit tracks ("wwwwwwaaabbits", no RRabbits, "wabbits", RRRRRRRRabbits, "wwwwwwwaaabbits" - I love that commercial :P) because they are too close together to be deer, and we don't have much else in terms of "wildlife" around here. 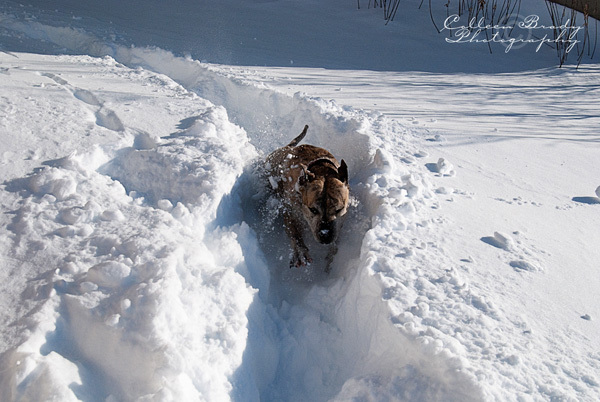 Plus, the snow is so thick and dense, a light-weight rabbit wouldn't sink too far into it. Snow-mageddon Part 1 of 2?? So, we got slammed with that big storm last week. That's what they were calling it - "Snow-mageddon". ON THE NEWS! Ridiculous. 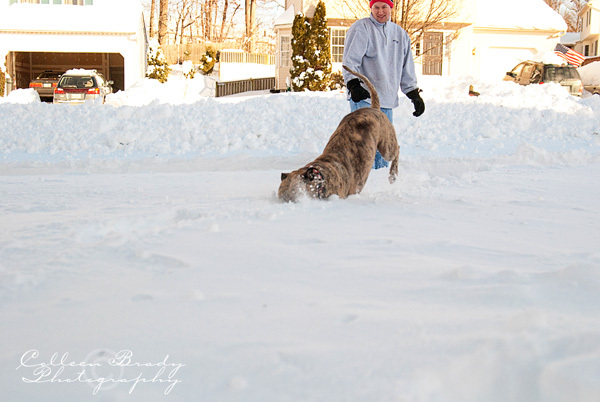 I mean, if we lived in Florida and got almost 3 feet of snow, sure, Snow-mageddon is appropriate. But we are *not* that far south people! Just because we're below the Mason-Dixon line doesn't mean the weather magically changes! We woke up friday morning, and I took a look at the radar. It showed that DC was already getting snow (supposedly) so I opted to stay home and work from home instead of going into the office. Jordan forgot his power supply for his laptop, so he went into work. It ended up not starting to snow until 2 or 3 in the afternoon, and then it was just flurries. Jordan left slightly earlier than a normal day, but then went and did some grocery shopping that we needed to do. Not "OMG WE HAVE TO GO BUY MILK AND BREAD AND EGGS OR WE'LL DIE IN THIS STORM!!" shopping, just some regular grocery shopping that we were due to take care of. But that's really how people around here think. The stores get mobbed and sell out of milk, bread, eggs, and toilet paper. I mean, they are really miserable at snow removal down here, but are you really going to go through 4 gallons of milk in 2 days? Are you really going to go to the bathroom THAT MUCH that you need 2 - 18 count packages of toilet paper? Let's use some common sense here people. 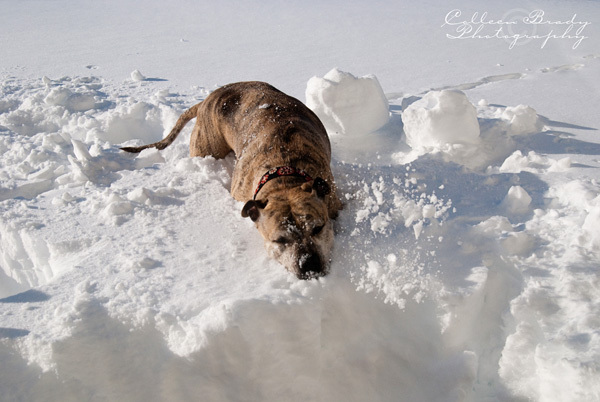 Since the snow was so deep, she couldn't touch the ground, but that certainly didn't stop her! 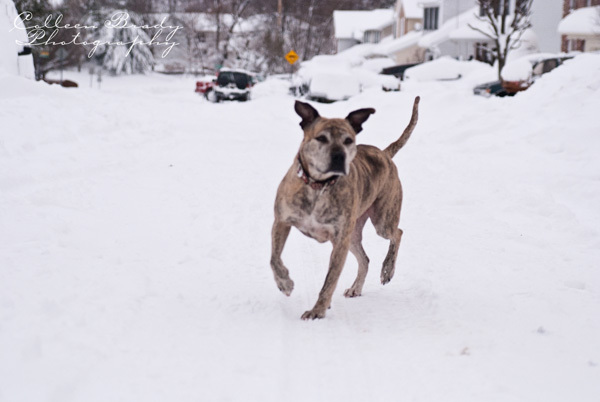 She jumps really high in the air to get herself up and over the snow, sort of like a deer. Regardless, it's hilarious. I really need to charge my point and shoot and take some video of it. 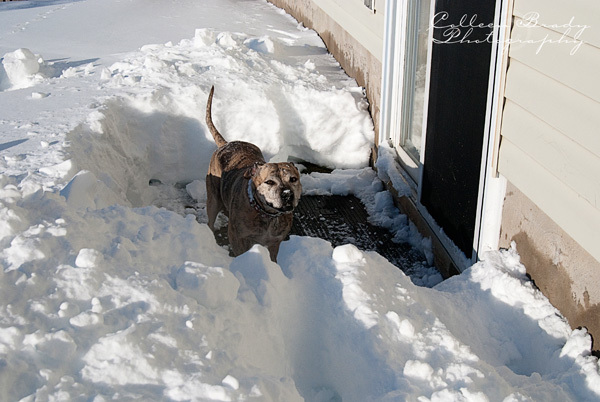 It's still deep in the backyard, we haven't made too much of a path back there yet. These 2 give a good idea of how deep it is. It's thick snow, so it compacts underneath you but you don't hit the actual ground. This is a path down the side of the house towards the sliding glass door. She really stretches herself out when she runs, lol! I just love her "serious concentration" face. 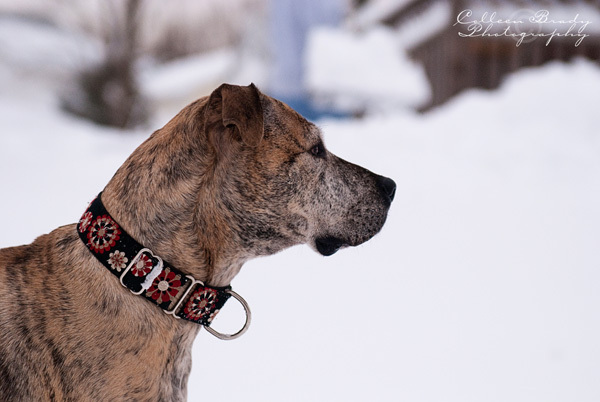 She's SO focused on something down the street - probably neighbors shoveling themselves out. Last one (for now anyway), kisses for momma! Everything is still pretty much a disaster. My PE prep course was cancelled last night because the roads and parking lot weren't plowed. The Federal Government was closed yesterday. About 9 counties of schools were closed yesterday AND today. I have 2 friends who are pretty much SOL at this point. 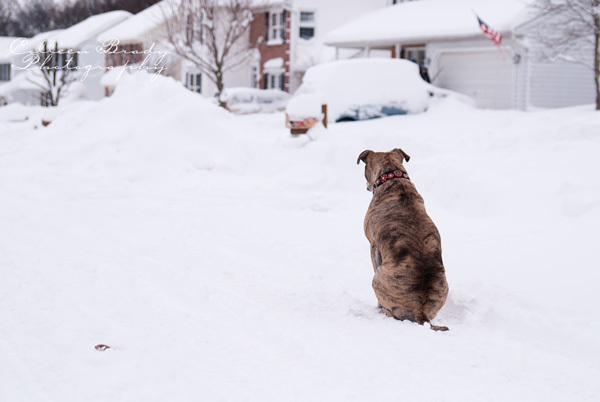 One lives in a cul-de-sac and still hasn't seen a plow (it's 3 days later!!) and the other lives in the city and was told that they weren't getting plowed. As in at all! No plows! She had to hike to a clear street and get a ride into work from a coworker today. What's worse (besides Jordan spending our entire commutes going on and on about how miserable the plow people are down here :p) is that another storm is coming in today and we're supposed to get anywhere from 10-20 inches!! They had to call people into work to shovel off the roof today. It can safely hold 30" of snow, but we already have 24" up there, and who knows how much this storm is gonna dump on us tonight. Better to be safe than sorry! I'm already counting on a snow day from work tomorrow (I have stuff I can bring home that I can work on), and I have zero faith that I'll class tomorrow night either. SUCH a mess! We shall see if tonight brings us Snow-mageddon Part 2!! Hahahahahaha!! Hello, Hello, Hello! As you can see, I'm NOT good at consistently blogging. I should work on that. 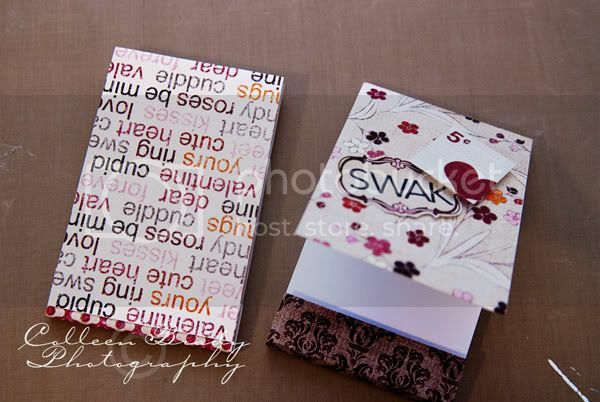 Today though, I have a little mini tutorial on altering a matchbook style notepad. SUPER EASY people!! I mean it! So as I was wandering around Michael's 2 weeks or so ago, they had a whole lot of bushel type baskets out, with tons of random crap inside, all on super clearance sale. For some reason, I can burrow around in bins like this in a craft store NO PROBLEM, but the clearance rack in a regular clothes store? No way. I am weird. So I rummaged around and found a little bit of this, and a little bit of that, and then I found these little matchbook style notepads. Wanna guess how much they were? Come on, guess. They were 2 in a pack too, if that helps at all. Give up? $0.40. FOR 2 OF THEM! That's $0.20 each for all of you who were told there would be no math on this blog (inside family joke if you're feeling lost). Jaaaaackpoooooottttttttt! So I did a little jig, and then I found as many of them as I could. Now it was time to play. So first, I measured the notepad. I pulled the front out from behind it's little flap, and I measured from that end, down the back, around the bottom, and to the top of the flap. It was a random number, so I ended up just going with an 11" length. Easy. Peasy. Then I measured the width of the notepad, which was about 3 1/8". Once I knew my dimensions, I opened up photoshop and created a new document 3.25" wide by 11" tall (I always give myself some wiggle room). Then I opened up aaaaaaaallllllll the patterned papers in the kit, and dragged and dropped them onto my 3.25"x11" blank document. Lots of times I will resize papers next, but since I was working with 11" I just left them as is. I like to play with all of the papers open to see different combinations and what I like and don't like. If I don't like a paper, I either turn off that layer, or delete it from the file I'm working in. Next, I pulled in a bunch of different embellishments from the kit. Those hearts with the scalloped circle mats were calling my name! I also grabbed 2 labels and 2 postage stamps (when it comes to embellishments, I tend to print out a few extras as I go, cuz I'm bound to change my mind several times before I actually glue anything down). I resized those to fit in the space on the front flap, and I was good to go. First, I opened up the notepad and put a line of my adhesive at the end of the cover flap. Then I lined up one edge of my chosen paper, and adhered it to the flap. Then I added some more adhesive to the rest of the front flap, and flattened the paper down onto it. I have an overhang on one end, but I will fix that later. Now, when you're dealing with things that need to be folded around, it's easiest to pre-fold it, and then adhere it. So with the front nicely glued down, I folded it around the top edges of the flap. Just use a little pressure to tell the paper where you want it to go. Now leave that, and get your second, contrasting piece of paper for the front flap. Do the same thing: glue it down to the front of the flap, then fold it around to the back of the notepad. Now you can see and decide which paper you want on top, and where you want the paper to end. Once that's done, just glue the papers down (I did not glue the paper to the thin folded spots, only to the main front and back of the notepad). You can see in the photo below, how I wrapped the papers around and then cut them down to the size I wanted. Now just add whatever embellishments you desire, and you're done! 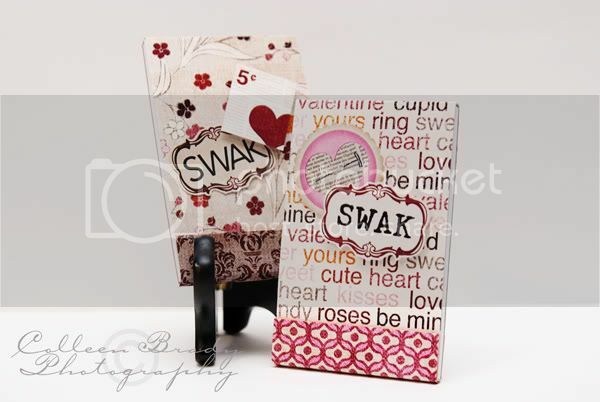 I added "SWAK" (sealed with a kiss) to each label piece with Making Memories rub-ons from my stash. I just love a good alphabet rub-on set! So, stinkin, cute! And you can make these for anything your heart desires with all the awesome digital kits that are out there now. Make one for groceries, make one for books you want to read for when you go to the library or the book store, one for movies, one for just random thoughts that pop into your head. The possibilities are endless!! My name is Colleen and I'm a Bridge Engineer by day, all around craft nut by night. 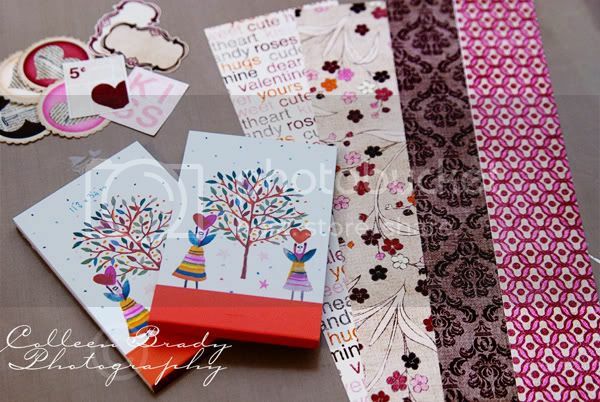 I am a digital scrapbooker, a hybrid artist, an amatuer photographer, a knitter, and a lover not a fighter.